When a devastating 2004 hurricane wiped out a Caribbean lizard population, University of California, Davis, researchers had an unprecedented opportunity to address a long-simmering controversy in evolutionary biology. Their findings — from the first experimental study of the so-called “founder effect” in a natural setting — are published in Friday’s (Feb. 3) edition of Science Express, the online publication of the journal Science, which will publish the study in print on Feb. 17. The founder effect describes the loss of genetic variation that occurs when a new population is established by a very small number of individuals from a larger population. But the extent to which this effect contributes to evolution has been up for debate since the early 1940s, when German evolutionary biologist Ernst Mayr first outlined it. Some scientists argue that the founder effect is pivotally important in how a species evolves. Others argue that it is a bit player on the evolutionary stage, quickly overwhelmed by the forces of natural selection. In their new paper, UC Davis scientists, together with researchers from Harvard and Duke, suggest that both sides are right. Complicating the debate has been the dearth of data from nature: Founder events are rarely observed. That opportunity presented itself in September 2004, when Hurricane Frances submerged several small, low-lying islands near Great Abaco, Bahamas. Before the hurricane, these islands supported populations of a Caribbean lizard, the brown anole, Anolis sagrei. After the hurricane, seven of the islands were thoroughly searched. No lizards were found. In May 2005, the researchers randomly selected one male and one female brown anole from lizards collected on a nearby larger island to found new anole populations on seven small islands. During the next four years, the researchers repeatedly sampled lizards from the source island, from the seven experimental founder islands, and from 12 nearby islands that served as a control. The team found that all lizard populations adapted to their environment, yet retained characteristics from their founders. For instance, lizard limb length correlates with the average diameter of vegetation on an island. Because the founder islands had smaller vegetation than the source island, the length of lizard limbs decreased, as expected, due to natural selection. But islands containing lizards with the largest limbs at the beginning of the study still had the lizards with the longest limbs at the end of the study. 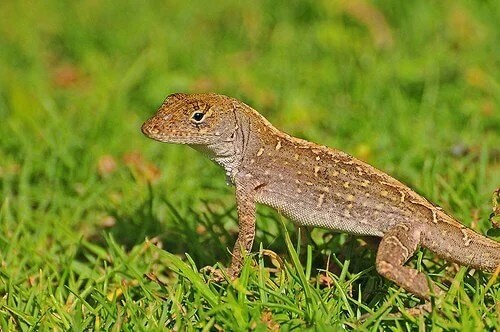 If natural selection had overpowered the founder effect, lizards’ limbs would have converged at the same length, regardless of how long-legged the founders were. Instead, limb length decreased roughly in parallel, signifying the persistence of the founder effect. The study, “Founder Effects Persist Despite Adaptive Differentiation: A Replicated Field Experiment in a Caribbean Lizard,” was supported by grants from the National Science Foundation. The study was led by Jason Kolbe and Jonathan Losos of Harvard University. Other co-authors are David A. Spiller, an evolution and ecology project scientist at UC Davis, and Manuel Leal of Duke University.